As I posted recently to the F This Movie! 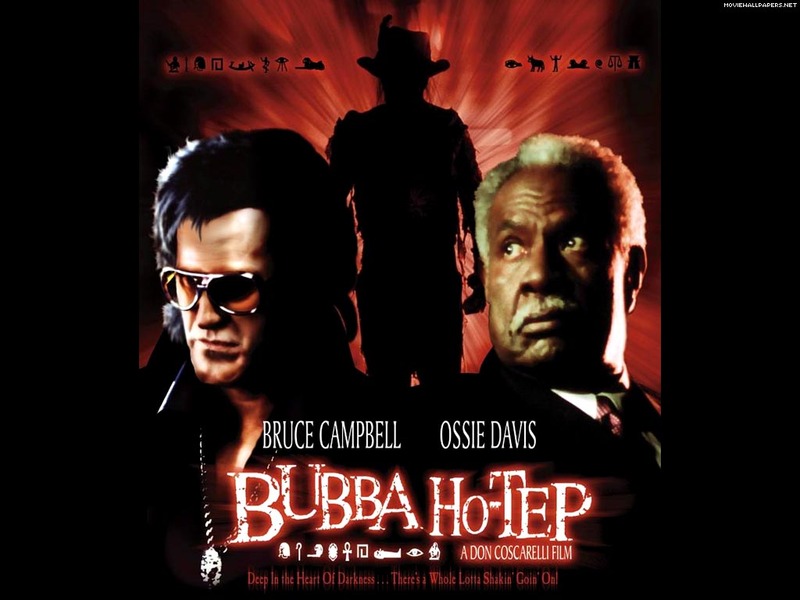 Scary Movie Challenge, Bubba Ho-Tep is clearly the best Elvis Vs. Mummy movie ever made. As it turns out, there are many other reasons to seek this film out. 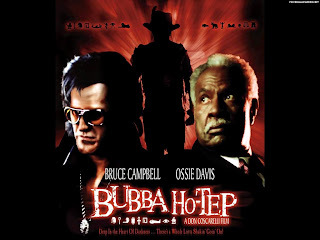 I liked Bubba Ho-Tep before, and I still like it now – but for different reasons. THE PLOT IN BRIEF: An elderly Elvis Presley (Bruce Campbell) finds himself with a broken hip in an East Texas rest home. How is this possible, you ask? Sometime earlier he switched places with an Elvis impersonator, à la The Prince and the Pauper, to escape the empty prison of fame. The impersonator dies of a heart attack; the real Elvis loses the original legal agreement in an unfortunate BBQ accident; no one believes he is the real Elvis. Old Elvis discovers there is a revived Egyptian mummy living off the souls of the other senior patients. He joins forces with John F. Kennedy (Ossie Davis--don’t ask) to battle the soul-sucking menace. I love this film. I love the WTF goofiness of it, but I also love how unexpectedly sad and thoughtful much of it turns out to be. Sure, Bubba Ho-Tep is a horror/comedy, but it has quite a bit more on its mind than Abbott and Costello Meet Frankenstein, The Rocky Horror Picture Show, or Tremors. Here I was complaining about loss of pride and how life had treated me, and now I realized... I never had any pride. And much of how life had treated me had been good. The bulk of the bad was my own damn fault. Should've fired Colonel Parker by the time I got in the pictures. Old fart had been a shark and a fool, and I was even a bigger fool for following him. If only I'd treated Priscilla right. If I could've told my daughter I loved her. Always the questions. Never the answers. Always the hopes... never the fulfillments. This is not the kind of schlocky, knock-off dialogue that we usually find in B-pictures, even the dozens of B-pictures made by Elvis himself. FULL DISCLOSURE: The pace of this film is… to put it mildly… sluggish. Don Coscarelli was clearly working on a small budget, so once Bruce Campbell is in the Elvis makeup in his nursing home room, well, you can bet we are going to spend a lot of time with Bruce in his Elvis makeup in his nursing home room. It takes a good third of the picture for things to really get going. This reminds me of a similar problem with Coscarelli’s earlier Phantasm, in which his rock-bottom budget and apparent desire to create a dreamlike state leads to endless Steadi-cam footage of the funeral home’s endless hallways. Phantasm’s funeral home corridors, by the way, bear an uncanny resemblance to Bubba Ho-Tep’s nursing home corridors. The man has a thing for long hallways. 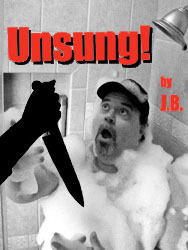 Perhaps this is the unsettling influence of Stanley Kubrick’s The Shining? FULL DISCLOSURE: Bruce Campbell’s Elvis impersonation is pretty awesome, especially when one considers that he is playing an imagined Elvis, an elderly Elvis that never really existed. In all fairness though, I must add that Campbell’s performance and mimicry are eclipsed by Ossie Davis’s dead-on Kennedy impression, and by that I mean, Ossie Davis’s fearless refusal to impersonate Kennedy in any way. AN ANNOYING AUTOBIOGRAPHICAL PAUSE: For a number of reasons — mostly the sort of pointless, excessive rumination that accompanies turning 50 — I had been having a bad couple of weeks. When I sat down to watch Bubba Ho-Tep for this column, I was at a low point. Sometimes there is a confluence between what is going on in our lives and the films we choose to watch. Bubba Ho-Tep spoke to me quite clearly; it made me feel a lot better. The fog lifted. The movie provided me with answers to some questions. I identified quite strongly with the place Elvis finds himself in at the beginning of the film. And the movie made me laugh. This is the same great truth that is at the end of Preston Sturges’s Sullivan’s Travels: we should never underestimate the power of laughter and nonsense in our lives. So I have to thank Don Coscarelli for making a funny and thoughtful Elvis Vs. Mummy picture that also pulled me out of a titanic funk. Thanks, Don. Thanks, Elvis… and Happy Halloween. My god, this is just a fun, weird and sad movie. I think this might have been the last significant Ossie Davis role and it's kind of great. Not many people could pull off with any sort of reality the line, "The CIA dyed me black!" but he does. Well said, Mr. B, this is a fun movie. Thanks for sharing the more personal details of your experience with it, and have a Happy Halloween, sir. JB, I agree, the pace is a little bit off, but the performances are great to hilarious and the whole thing is really surprisingly touching at times. That was something I didn´t expect and that is very rare in this kind of film.